Everyone knows firefighters are brave. If we needed more proof I watched their bravery in action this morning. 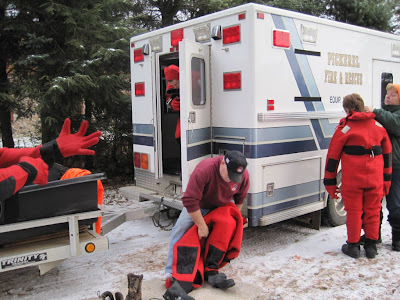 They are such incredible professionals and there is no one better with cold water rescue. A team of seven men and women assembled at 8:30 sharp at Duck Lake. Then just like the story of Santa Claus, they "set right to their work". 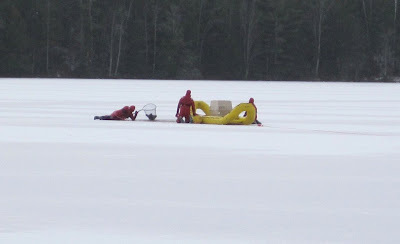 Before I knew it they had the craft inflated, safety lines attached, the team was suited up and they were making their way 150 feet to the stranded loon in a very small opening of Duck Lake. 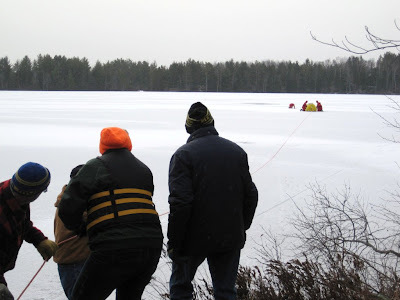 The ice was thin, too thin I thought for this fine team to put their own lives in danger to rescue a loon, no matter how beautiful the loon and compelling the story. I started waffling about if this was a good idea when I heard ice had formed only days before. They checked the ice thickness. They agreed it was thin but were confident they would be OK. This was going to be good "training" for them they said. It was good training, I will give them that. 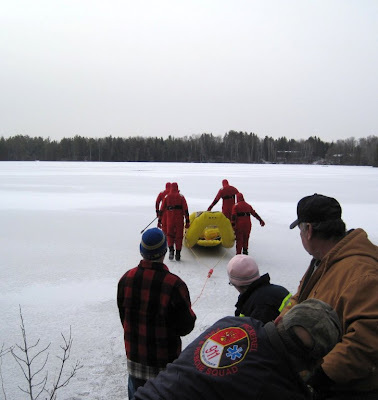 Better to train on a loon rather than to have a person in the water in an emergency situation. However, they are still some wonderful individuals to help us with a wildlife crisis. About this time I started seriously holding my breath and praying. What a morning it has been! We didn't know until last night that the loon was in trouble. With the serious weather coming in this afternoon I didn't think we had a chance to get this guy out of his predicament. The residents of the lake have been watching the loon family. The male injured his wing months ago. His long time mate ( 20 yrs so?) stayed until late November but had to leave to save herself by that time. By the time his wing was well the loon was in poor muscle condition and did not have the physical strength to take off the lake. Any time there is a fracture of a limb no matter if it is in a human or a loon, the muscle tone is compromised. That is where physical therapy comes in. 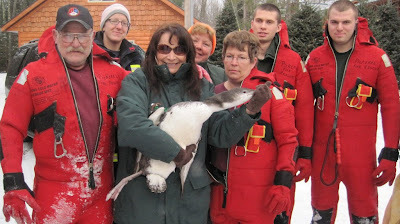 For this Common Loon, the physical therapy would have been flying. It was like a domino effect. Now he will have good food and then a trip to the Gulf of Mexico soon to rejoin his mate and have the winter to regain his flight for the trip home in spring. Thanks seems pale for what the Pickerel Fire and Rescue did today. You are just the BEST and we are so very grateful! To top it off they are a volunteer department. Pickerel is very lucky to have these fine professionals a phone call away. 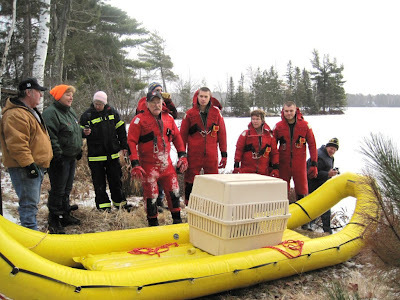 Howie was very clear that they were happy to help with stranded animals so they don't have to save a person that attempts to save an animal themselves. 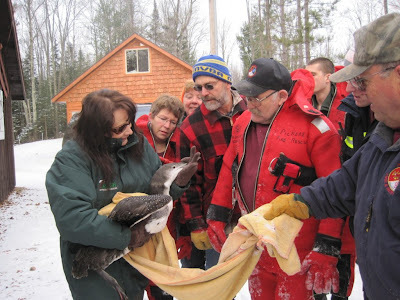 Each year we have situations where people try to get geese or other animals that have gone through thin ice. And every year we have close calls with people breaking through ice early in the winter and late in the spring. This is a job for professionals and should never be attempted by people no matter how compelling the case. Marge, your dedication to the well being of this loon is absolutely wonderful! 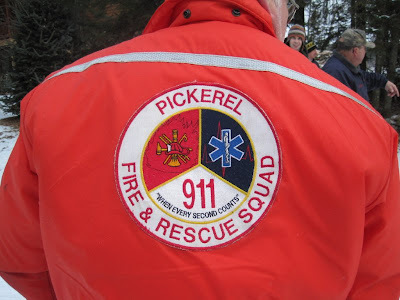 Thanks to Pickerel's Fire & Rescue Squad. 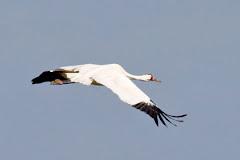 A great story to save a storied bird.....Thanks for all you do. Thanks for saving our loon!! 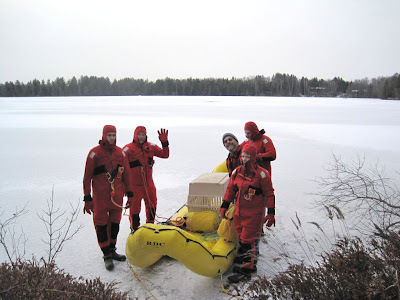 What an awesome group the Pickerel Rescue Squad is! Caring for "Big guy" was a honor. Seeing him leave captivity forever was beyond words.